eDiplomacy has dramatically changed the way diplomacy is being conducted. The State Department now communicates directly with more than 15 million people via social media—at the push of a button. 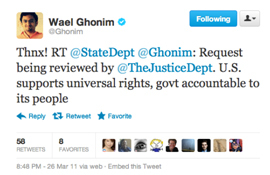 Citizens no longer need to physically go to embassies to have their questions answered—they can simply read tweets. Viral videos can instantly force their way onto a foreign policy agenda and private corporations are exploring the State Department’s innovations. Fergus Hanson examines data showing the impact of ediplomacy on U.S. foreign policy abroad. Many foreign policy mandarins might not like or understand it, but the foreign policy operating environment is changing quickly. 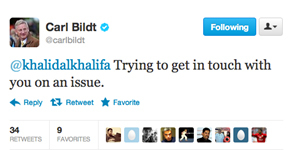 When in 2011 the Swedish Foreign Minister, Carl Bildt, was unable to get in touch with his Bahraini counterpart during the heat of the protest movement there, he opted to publically shame him via Twitter. 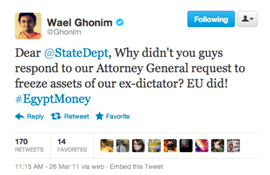 When General Electric was selecting topics for a summit of its most senior government relations executives, it chose Google….and the U.S. State Department’s ediplomacy. When on July 12, 2010, Terry Jones, a fundamentalist reverend from Florida, wrote a series of tweets attacking Islam, one of which read: “9/11/2010 Int Burn a Koran Day” news of his proposal spread virally resulting in a wave of global protests, some of them deadly. The adaptation to this new environment and integration of new technologies into diplomacy is one of the biggest challenges foreign ministries—and corporations—have faced in many years. And it has led to a string of attempts to describe the change afoot. The State Department calls it 21st Century Statecraft; the UK Foreign Office uses the term Digital Diplomacy; while the Canadians refer to it as Open Policy. This paper refers to it as “ediplomacy” and uses a slightly amended definition previously proposed by the author. It defines ediplomacy as: the use of the internet and new Information Communications Technologies to help carry out diplomatic objectives. At the vanguard of this adaptation is the U.S. State Department. The first paper in this series, Revolution@State, found over 150 people employed in 25 separate ediplomacy nodes covering eight different work areas. 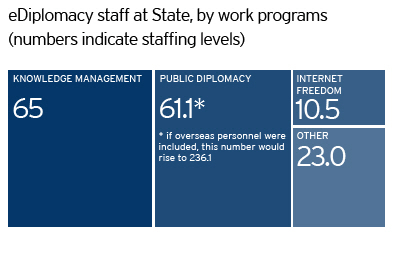 At U.S. missions abroad, another 900 staff used ediplomacy tools to some extent. This paper is focused on just three of those eight areas where State is currently allocating the bulk of its ediplomacy resources: public diplomacy, internet freedom and knowledge management. Its starting point comes from this video extract: as the Godmother of 21st Century Statecraft, Hillary Clinton, steps down as Secretary of State, is ediplomacy now baked into the Department?